Tom Johnston became editor of Forward, the weekly newspaper of the Independent Labour Party (ILP)in 1906 and won acclaim for his crusading socialist journalism. The paper was against the First World War, viewing it as a means of exploiting the working classes. He entered parliament as MP for West Stirlingshire in 1922 and became close to the Clydeside group of MPs led by James Maxton, though his views were more consensual than the latter. 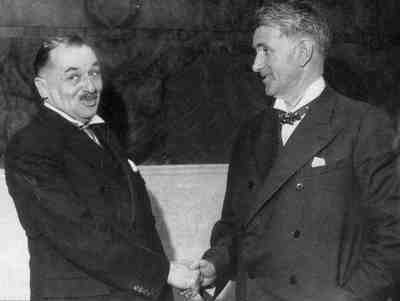 He was appointed as Under-secretary of State for Scotland in the Ramsay MacDonald Labour Government of 1929, and a Cabinet post in 1931. "I have become, and increasingly become, uneasy lest we should get our political power without first having, or at least simultaneously having, an adequate economy to administer. What purpose would there be in getting a Scots Parliament in Edinburgh if it has to administer an emigration system, a glorified poor law and a graveyard?" Just prior to the declaration of war in 1939 he became regional commissioner for civil defence in Scotland and when Winston Churchill became Prime Minister, he persuaded Johnston to join the coalition government as Secretary of State for Scotland (1941-45). 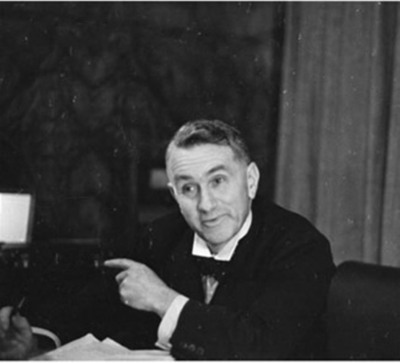 As Secretary of State, he was instrumental in creating the Scottish Council on Industry and in 1943 the North of Scotland Hydro-electric Board to generate employment, improve social conditions, and power new industries. He was the Board's Chairman from 1945 to 1959, by which time most of the Board's generation stations were complete and the supply network had extended to almost 90% of the country. He was highly regarded as a particularly effective and one of the greatest Scottish secretaries. He also acted as Chairman of the Forestry Commission, the Scottish Tourist Board and was a governor for the BBC and, on principle, took no payment for these positions. Born 2 November 1881, Kirkintilloch, Scotland. 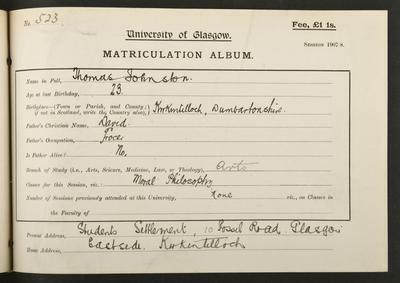 Tom Johnston (1881-1965) was a student at the University who became a socialist politician, a Red Clydesider, and a campaigning journalist. He became a very successful Secretary of State for Scotland during the Second World War and was the creator of the North of Scotland Hyro-Electric Board. He was born in 1881 in Kirkintilloch and educated at Lairdsland Public School and Lenzie Academy. After he left school he became interested in politics and stood successfully for a local election in 1903 representing the Independent Labour Party. In 1906, thanks to inheriting a printing press from a relative, he was able to set up The Forward, a radical weekly paper that reflected his Fabianism and teetotalism. He remained editor until 1933. It was in the early days of running the paper that he matriculated at the University of Glasgow as a mature student of twenty-three. In 1907 he took a class in Moral Philosophy and gave his address as the Student Settlement, a pioneering student association interested in social improvement. The following year he enrolled for Economics, but he left without graduating. During the Great War he advocated peace and attacked war profiteers. After the war he stood for parliament, and in 1922 won West Stirlingshire for Labour. The period of his greatest achievement was during the Second World War. Churchill appointed him as secretary of state for Scotland in 1941. He worked with colleagues of all parties to galvanise the Scottish economy on a war footing and created the North of Scotland Hydro- Electric Board. The University of Glasgow conferred the degree of Honorary LLD in 1945. He died on 5 September 1965. Walker, Graham. 2004. Johnston, Thomas (1881–1965). Oxford Dictionary of National Biography. Miller, Jim. 2003. The dam builders: Power from the glens. Edinburgh: Birlinn. World Changing Project, "Secretary of State for Scotland 1941-1945," in University of Glasgow World Changing (University of Glasgow, 2010); http://www.worldchanging.glasgow.ac.uk/article/?id=87 (accessed April 23, 2019). World Changing Project. "Secretary of State for Scotland 1941-1945." In University of Glasgow World Changing. University of Glasgow, 2010. http://www.worldchanging.glasgow.ac.uk/article/?id=87 (accessed April 23, 2019). World Changing Project. "Secretary of State for Scotland 1941-1945." University of Glasgow World Changing. University of Glasgow, 2010. 23 April 2019 <http://www.worldchanging.glasgow.ac.uk/article/?id=87>.